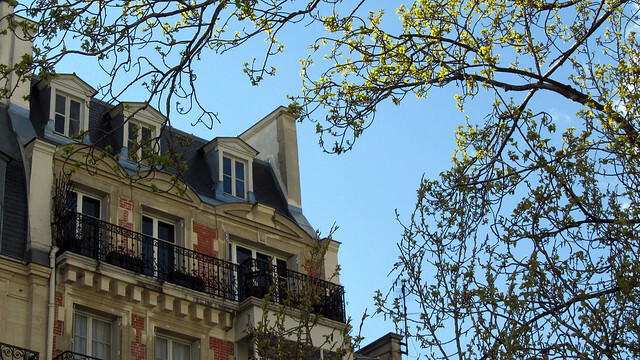 Now that spring has truly arrived, a massive spring cleaning is required chez nous. Not that we’re normally incredibly messy people, just that we had workmen in for a good few days fixing and repainting the windows. The layers of dust that settled on just about every surface had me cringing silently, so a top-to-bottom cleaning is definitely required. Still, I’m taking a little break to bring you the latest round-up of Project 365. 22 Apr: A Keith Haring retrospective is currently running in the Musée d’Art Moderne de la Ville de Paris. 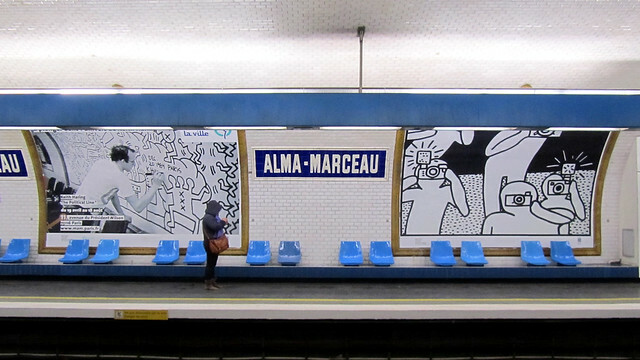 For a week, the métro station of Alma Marceau was transformed into a cultural station, showcasing some posters of this pop-art master, featuring the iconic jelly bean-like figures in striking bold colours or in black and white. This exhibition – themed Political Lines – is on my to-visit list, and if you are in Paris, you shouldn’t miss it either. 23 Apr: This is the view I’ve been enjoying from my desk in my office. In the last few months, the tree was bare and the sky often grey. Now, leaves are starting to make their appearances and the sky bright most of the time. However, I have only a few more days to enjoy this view, as my work contract comes to an end and I’m taking a change of direction in my career. Is the change scary? Yes. Is it exciting? Oh yes! It is going to be an interesting and challenging time. 24 Apr: After our impromptu picnic date this evening on the lawn of Champ de Mars, Frédéric and I bought some gelati from Grom and strolled to the Pont des Arts just in time for sunset. 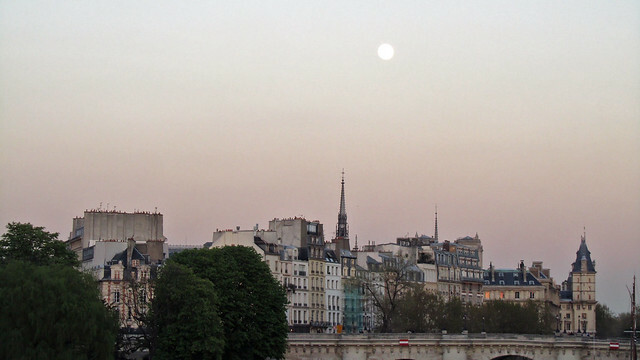 To the west, the sky was an intense blend of shades of orange and crimson, but to the east, a pinkish hue and the (near) full moon perched prettily above the Île de la Cité. 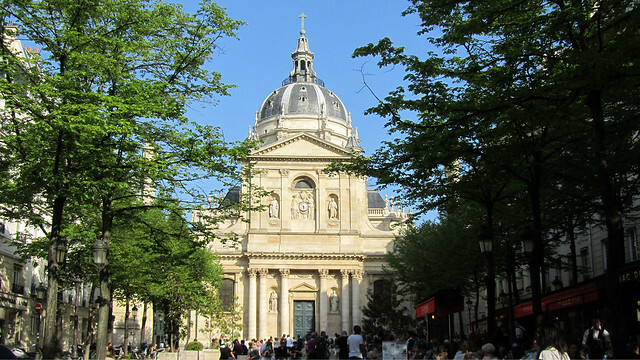 So much Parisian charm and beauty surrounding us, while Mother Nature envelopped us with her own kind of magic. It makes you the wish the moment would last just a little bit longer. 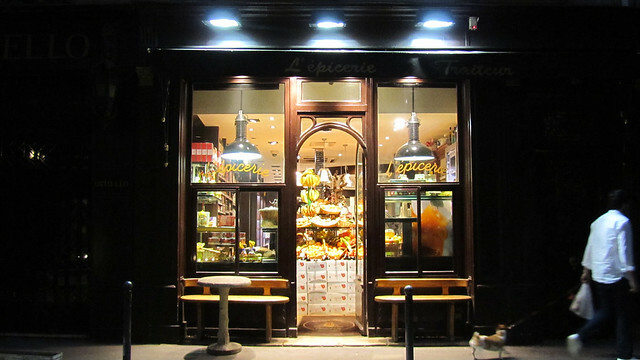 26 Apr: This has to be one of the dinkiest epicerie we’ve came across in Paris. With the door just about large enough for one person to go through at a time, space is indeed a premium here, but it doesn’t stop the owner (a famous florist actually – Olivier Pitou – with the flower shop just on the opposite side of the street) from stocking a large variety of gourmet finds as well as fresh produce. With long opening hours (9am-11pm) a hungry soul in the neighbourhood need not go without a delicious meal, which can be picked up here quickly. It does come with a corresponding price tag though. 27 Apr: The weather for the afternoon has been a rather particular one. On one side, you can see the menacing dark sky advancing, threatening to pour a gazillion buckets of water over us. On the other side, the sun was out and it was sunny. 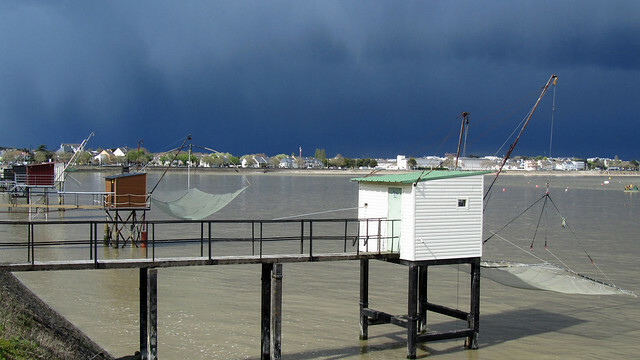 Just look at the brightly lit walls of the fishing cabins and the shadows cast onto the water. As the tide was high, there were some people out there fishing – the net is lowered into the water and lifted up periodically. Trapped fish would be scooped up using a smaller net on long stick, so to reach the centre of the large net. It’s fairly fascinating to watch the process. 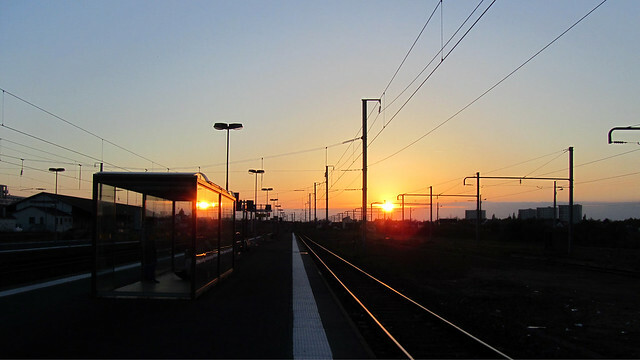 28 Apr: Our short weekend trip to (historical) Brittany ended quickly, and soon after dinner, we found ourselves at the platform of the train station, waiting for our ride back to Paris. The sun is setting later and later nowadays, so we managed to catch the magnificent colours before boarding. It was a beautiful setting to cap the weekend, on which I’ve managed to stay relatively offline and therefore got to enjoy the great outdoors as well as catching up with readings. I’ve not realised just how much I miss these simple little things. I love the sunset photo! looks like a great week woohooo..happpeeeyyy spring cleaning!